Will 2019 be the Year of the Baby? I’m hoping, yes. Perhaps this will be the year that babies are finally acknowledged as uniquely capable, full-fledged people. Maybe parents and caregivers will realize that babies are born knowing something about their development and can be trusted to demonstrate readiness for developmental milestones by “doing them”. If we believe in babies, then we give them opportunities to show us what they’re working on, and they’ll do the rest. This begins with allowing infants plenty of time to move their bodies freely and naturally and trusting them to direct their motor development. In the New Year (and always), may the time you’re blessed to spend with babies be joyful and inspiring. Cheers! Janet, I have been following your site for a few months already and have enjoyed the majority of your articles, we are planning a second baby and would love to try to incorporate RIE, I still feel though that it would be a leap of faith to ignore the AAP’s advice on providing tummy time, I love the video, the baby seems so content doing what he is doing but he has a bald spot on the back, I have talked to my husband about this and he completely agrees with the RIE idea in regards with tummy time and thought there was nothing to worry about with bald spots or flat head, do you have something that could help ease mi mind? Thank you very much in advance. It can be so hard to go against established, acceptable medical advice,and commonly accepted ways of doing things. That is very helpful Lisa, will keep it in mind, I imagine is all about balance too, they also need to be carried sometimes, or when they sleep at some point they turn their heads anyways. Our little girl had a bald spot as well, but I do not attribute it to not giving her tummy time, but rather the fact that when she was over-tired she’d swipe her head back-and-forth, back-and-forth, back-and-forth when she was struggling to get to sleep. When she lay on her back and moved around freely, she moved her head this way and that, so it wasn’t always static in one place. Also, I don’t think a few minutes or half an hour of tummy time would really make too much difference on the bald-spot arena (assuming they’re not strapped in somewhere most of the time). And I totally agree with Jefra regarding flat-spots. 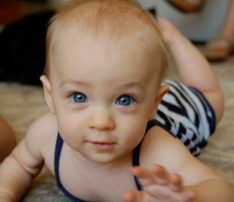 That if baby is allowed to move freely, she will move her head as well, to investigate things around her, thus a flat-spot due to ‘lack of tummy time’ should not occur. Also I read somewhere (here or the community perhaps?) how a baby’s head can be likened to a water-balloon. In the beginning, before it is ‘filled up’ it is flat in the area that is on the table, while the flat spot gets smaller and smaller as it grows to it’s maximum size. Of course not directly transferable to a baby’s head, but you get the idea. That seems to fit well with the results from Dr. Greene’s research (not that a baby’s head doesn’t grow after 2 years of age, but that ‘deformities’ mostly disappear). I am on my third baby. My other two kids hated tummy time. I decided instead of torturing them constantly crying and me feeling guilt my last baby is going to be tummy time free. She is 4 months and rolled back to tummy in her own terms (when she rolled she also had the head strength to hold her head up) under two weeks later she is a pro and is starting to lean towards rolling back to tummy. She is the earliest roller in the family with zero tummy time. She doesn’t have a flat head at all and has her hair rubbed off in sections but it’s all evening now. I am like you and for the most part try to follow the recommendations of AAP. I have come to realize that although AAP’s guidelines are based on extensive research, it takes time for them to make “official” policy changes. I try to stay current on child development research and then following my motherly instincts. I think that often times the flat head comes from when babies are placed in infant carriers, swings, and bouncy seats for too long. I think this really restricts their movements, even their heads. And then when they sleep in them, their heads fall to one side and that can lead to a flatter spot on one side. I liked the research article that Lisa mentioned and it makes sense to me based on my own observations of children. My son didn’t have flat head, but it wasn’t the roundest. But now that he’s older it seems to have rounded out very nicely. He did have a bald spot too, but that just might be inevitable for some babies. I didn’t know about RIE when my son was born (he’s 2.5 now), but it is very similar to what I was taught as a child development major. I have learned a lot about RIE just in the few months I have been reading about it and have incorporated many new ideas into how I interact with my son. When we have a second child, we will definitely be using RIE principles right from the start. Lisa and Jefra, I appreciate your thoughtful responses to Vanessa…and my experience is in accordance with the ideas you’ve both presented. I can also guarantee that the current research does not include a sufficient sampling of infants who have been given adequate floor time (or playpen time) and allowed to move in a free, inner-directed manner. Free movement and floor time is not widely advised yet (unfortunately), but it IS the answer to babies meeting their milestones and avoiding the majority, if not all, of the flat-head issues. Magda Gerber is the only expert I have heard say, yes, babies need to be held and cuddled, but they need lots of free movement time, too. Hi Vanessa, I have been looking after children for 20 years and specifically newborns for the past 7 years. I can share with you that pretty much ALL babies rub the hair off that part of their head. I am looking after a gorgeous baby at the moment who has done just that by discovering that her head does in fact move from side to side. I have never agreed with tummy time as babies just don’t seem to enjoy it, but I do tend to have them on my chest and they look up at me and strengthen their neck that way. Good luck with your plans. My child spends lots of time on her belly and still has that bald spot on the back. My theory is that it’s that newborn hair falling out exacerbated by that being the hot spot where their head makes contact with the surface of wherever they’re placed. No head flattening accompanies it with my daughter. It’s cosmetic. Hi Avra (and Jad!). It sounds like Jad is right on schedule. Some infants take longer to feel comfortable on their tummies and it sounds like Jad is on the verge of being able to roll to his back again by himself, which will give him much more confidence in the tummy position. I think you are handling this just right…allowing him to choose this experience and then maybe struggle a little to figure out his next move while you talk him through it. Then, if his discomfort persists or his whining turns to crying, I would definitely pick him up and give him a little break before placing him on his back again. I just wrote about his on Lisa’s blog, but figure I’ll chime in here too! My daughter just rolled from her back to her belly for the first time on the eve of New Year’s Eve. It was interesting to watch how I was starting to get anxious about the fact that at a little over five months old she hadn’t done it yet. Even though in the past I’ve always told other parents to trust their baby’s timeline, I was having a hard time trusting my own! I really appreciate the support and encouragement I get from reading your blog and Lisa’s blog. It can be so hard to go against the grain without support. @VANESSA – I also was starting to worry about a flat head. My daughter has been only on her back and hasn’t had any adult directed tummy time. I wrote to Lisa and she wrote back with the reassuring study from above. I also took my daughter to the osteopath because I had started to notice a small flat spot on her head. The osteopath told me that it had nothing to do with lying on her back but was a normal part of the development of the skull at this point. I am so glad that, with the support of blogs like this one, I continue to trust my babies own unfolding. One night I was watching her lie on her back playing with her fingers in such a delicate and beautiful way. Then she played with her toes (including sucking on them!) I was thinking that she wouldn’t be doing this if I was forcing her to engage her gross motor skills before she was ready — she’d be too caught up in trying to support herself in ways she wasn’t actually yet ready to support herself. I felt so happy in that moment that I know about RIE, not only because it gives her the time and space to develop according to her own impulses but also because it has given me the eyes to be able to enjoy and take pleasure in witnessing such small things in her development that I might otherwise not see. 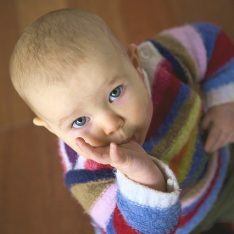 @Vanessa and others, I just received a wonderful photo of Baby Juliet (the baby in the video). She’s now one year old and has the roundest head I’ve ever seen and no bald spots (my children’s hair changed dramatically in their first months of life, falling out and coming back in again a different color). Wish I could post the photo of Juliet here in the comments! I am so happy that I have stumbled upon your blog. I happened to come across it as I was searching for “play time” ideas for my nearly 9 month old daughter. Long story short, my daughter has 3 hemivertebrae in her spine which caused congenital scoliosis and in addition to that was in a DB hip brace from when she 8 weeks until about 7 months old. Most of that period she wore the brace 23 hours a day. Obviously this slowed down her motor skill development as she had restrictive movement. Throughout the process the Children’s Hospital has recommended I see a physiotherapist to aid her in her development along with stretches for her torticollis. I guess what I am writing for is that I find myself torn. In the beginning my daughter only had very simple toys and I allowed her to discover things on her own, this is what felt instinctually right to me. Throughout visits to the physio, doctors, and seeing other babies her age a playgroup, I began to worry that I was not engaging and stimulating her enough and just last month bought some “stimulating” toys. All along it didn’t feel right to me but I was scared I wasn’t doing enough. It has been such a relief to find your blog. In regards to tummy time…my physio has pushed and pushed me to give my daughter heaps of tummy time and aid her in learning how to roll over. She explains that tummy time is escpecially good for developing her back muscles. My daughter used to happily lay on the floor lift her feet to her mouth and roll to the side, often. Now after “aiding” her in these movements she hardly does it and often arches her back when I try to “help” as instructed. After reading some of your articles yesterday I allowed her to do her own thing and this morning she nearly rolled to her tummy on her own! BUT I could see a point where she just got scared and rolled herself back. I truly believe this hesitation and scared reaction is result of my “helping” her to roll previously. 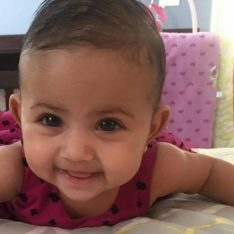 After this very long winded post, I guess what I am seeking guidance on is should I just trust that my daughter will roll and do tummy time on her own accord? I suppose physios, doctors, etc…push me to intervene because she is nearly 9 months and hasn’t reached these “milestones.” My perspective is that she has a lot of time to make up for because she was in the brace for so long. Amongst all of this we discovered that she has the balance to sit up if we put her in the sitting position and when we started doing this her verbalisation, reaching/grabbing, and shaking/banging things all started happening. At that same time, all efforts to roll stopped! So, should I start laying her back on her back to allow her discover for herself how to roll and sit up on her own or is sitting a good option for her? What should I do in regards to her play time? Also, how long should I leave her to play on her own? I think previously I was “in her face” too much, but since reading your blog yesterday I feel like I am not engaging with her enough. She’s awake for about 2 1/2 hours at a time…besides feeding, nappy changes, etc… for what periods should I allow her to play on her own? She’s pretty placid and if not hungry or tired won’t complain much about being left alone. Although I do sense her frustration when she can reach something. I know I shouldn’t intervene, but what point do you intervene? Any tips you have to offer are greatly appreciated. You are a sensitive, insightful mum with phenomenal instincts and my best advice is to keep listening to them. Rather than sitting your daughter up, I’d let her spend time on her back and trust her to work on rolling…sounds like she’s just about there! From rolling she will begin to pivot and then scoot across the floor, experiment with being on all fours and then discover she can sit and crawl. These are all vital developmental steps and we don’t want her to skip any of them. Besides, she deserves to experience mastery just as much as a typically developing child and she needs to feel trusted so that she can keep trusting herself. Those things are far more important than the exact age at which she achieves milestones…because they’re the basis for her self-image and self-confidence. One of the problems with sitting her up now is that it freezes her. She can’t get herself out of that position independently unless she falls. Sitting her up may change her attitude for the moment, but it will not foster the body confidence she’s fully capable of having. And she really will get there soon on her own if you give her the time moving freely that she needs. I think you’re spot on about her “having a lot of time to make up for”. Be patient. It will pay off for both of you. As far as play time, I believe that she needs you to trust her there, too. Allow her to tell you when she’s had enough… You could even say, “Please call me when you need me…when you’re tired of playing.” She’ll do it! She sounds like a remarkable girl. Please keep me posted… and take good care. I am a childminder (home childcarer) in the UK, have been a follower of your FB page for some time, and become very intersted in RIE. Today I have been on a training course about Baby Development for early Years Practitioners run by the Local Education Authority. We were instructed that we MUST give all babies tummy time every day as an essential part of their development. I questioned their advice and cited the RIE theories regarding tummy time. I had no idea I would be perceived as such a radical!! The course providers are keen for me to provide them with some literature to support my/your theories. Do you have any specific literature that I can present to them, please? I have fought doing tummy time for my now 4 mo old with my husband, family and friends. So when my son started rolling over back to belly before Christmas the family was so suprised at how calm and determined he was to get positioned on his belly! At first it took him 3-5 mins to free his little arm and everyone wanted to intervene, but I forced them to be patient and trust in my little guy. More than a couple commented on how impressed they were and why they now understood why I wanted him to decide when he was ready to be on his belly. Unfortunately I am still fighting my husband about the Johnny jump up… Great post & video as always!! I am not sure where this question belongs on your blog, but I need some reassurance regarding tummy napping. Our baby’s physical therapist suggested that he naps on his tummy for head shaping since he is on his back for sleep during the night. She has not specifically endorsed the type of “tummy time” as referenced in the article, but does recommend 1/2 his awake time be tummy time which can include sleeping or being held on our chest. When he naps on his tummy, he takes long naps – up to 2.5-3 hr. I sit in the nursery and watch him since he is only 11 weeks old. When he naps on his back he startles himself with arm and leg movements so the naps are much shorter. What is your recommendation? Can the way he is napping now influence sleeping habits in the future? Is tummy napping safe? I’m curious about this too. My LB (now 2) definitely preferred to sleep on his tummy as a baby (nights and naps). So I read some of the scientific research about sleeping on the back being safer in terms of SIDS, and I wasn’t convinced by it to be honest. I took the risk and let him sleep on his tummy (in the very early days due to severe reflux, this happened on my chest as we co-slept). His sleep (and mine) improved 100 fold. I would never recommend it to anyone (for obvious reasons), but I discovered that there are still many, many moms who allow it. Our 6 month old can roll onto her tummy in either direction but consistently screams whenever she is there. She wants to be seated or held to stand. I understand that RIE methods encourage natural development of these postures, but how do we get her past the “shut-down” mode of being on her belly into a place or manageable frustration? I wish I could share this with my new mums group but I would be looked upon as radical because ‘tummy time’ has become so ingrained in parenting practices. I am always blown away when we get together and they all, I mean ALL place their babies on the floor on their tummies to ‘play’ – I notice they can’t play because they’re frozen in an imaginary box?! I can only role model and place my boy on his back and he is the most active of all because he’s free to move! It’s just bizarre to me why they do this? !